The long awaited details of Geithner's "plan" for dealing with bad bank assets is finally out. Githener's plan is disingenuous at best. If people want to be outraged at something, it should be over Geithner's plan. The Wall Street Journal has the story in Timothy Geithner: My Plan for Bad Bank Assets. The American economy and much of the world now face extraordinary challenges, and confronting these challenges will continue to require extraordinary actions. No crisis like this has a simple or single cause, but as a nation we borrowed too much and let our financial system take on irresponsible levels of risk. My Comment: Actually the root cause is simple to understand, micro-mismanagement of interest rates by the Fed, Fractional Reserve Lending, and Congressional spending run rampant. The depth of public anger and the gravity of this crisis require that every policy we take be held to the most serious test: whether it gets our financial system back to the business of providing credit to working families and viable businesses, and helps prevent future crises. Today, we are announcing another critical piece of our plan to increase the flow of credit and expand liquidity. Our new Public-Private Investment Program will set up funds to provide a market for the legacy loans and securities that currently burden the financial system. The Public-Private Investment Program will purchase real-estate related loans from banks and securities from the broader markets. Banks will have the ability to sell pools of loans to dedicated funds, and investors will compete to have the ability to participate in those funds and take advantage of the financing provided by the government. The funds established under this program will have three essential design features. First, they will use government resources in the form of capital from the Treasury, and financing from the FDIC and Federal Reserve, to mobilize capital from private investors. Second, the Public-Private Investment Program will ensure that private-sector participants share the risks alongside the taxpayer, and that the taxpayer shares in the profits from these investments. These funds will be open to investors of all types, such as pension funds, so that a broad range of Americans can participate. Third, private-sector purchasers will establish the value of the loans and securities purchased under the program, which will protect the government from overpaying for these assets. My Comment: The Government has agreed to finance 93% of the loan, and it is a no recourse loan. This provision is in place for one reason only: To insure that investors overpay for bad bank assets, at taxpayer expense. Please see Geithner's Plan, a Gigantic Confidence Game for more details. The new Public-Private Investment Program will initially provide financing for $500 billion with the potential to expand up to $1 trillion over time, which is a substantial share of real-estate related assets originated before the recession that are now clogging our financial system. Over time, by providing a market for these assets that does not now exist, this program will help improve asset values, increase lending capacity by banks, and reduce uncertainty about the scale of losses on bank balance sheets. The ability to sell assets to this fund will make it easier for banks to raise private capital, which will accelerate their ability to replace the capital investments provided by the Treasury. My Comment: The PPIP will not do anything for the value of bad assets on bank books. Moreover, if PPIP is "successful" all that really will have taken place is to offload risk (swindle) taxpayers, for the benefit of Geithner's banking buddies. For comparison purposes, this swindle makes the Savings and Loan Scandal look like a picnic in the park. Our approach shares risk with the private sector, efficiently leverages taxpayer dollars, and deploys private-sector competition to determine market prices for currently illiquid assets. Simply hoping for banks to work these assets off over time risks prolonging the crisis in a repeat of the Japanese experience. My Comment: The government (taxpayer) is taking 93% of the risk. In my opinion that makes claims of sharing the risk a blatant lie. Moving forward, we as a nation must work together to strike the right balance between our need to promote the public trust and using taxpayer money prudently to strengthen the financial system, while also ensuring the trust of those market participants who we need to do their part to get credit flowing to working families and businesses -- large and small -- across this nation. My Comment: Geithner and Bernanke clearly do not understand the problem. The reality is are few credit worthy borrowers to lend to and therefore no reason for banks to lend. Moreover, with rampant overcapacity and a slowing economy there is no good reason for credit worthy borrowers to borrow. Thus, the idea that credit will start flowing again if bad assets are removed from bank balance sheets is patently false. This requires those in the private sector to remember that government assistance is a privilege, not a right. When financial institutions come to us for direct financial assistance, our government has a responsibility to ensure these funds are deployed to expand the flow of credit to the economy, not to enrich executives or shareholders. My Comment: Looking at the details of the program, one might easily assume the sole plan was to enrich executives and shareholders at taxpayer expense. We cannot solve this crisis without making it possible for investors to take risks. While this crisis was caused by banks taking too much risk, the danger now is that they will take too little. My Comment: This is more disingenuous nonsense. The real danger now is the Fed or Congress forces banks into more reckless lending. Our nation deserves better choices than, on one hand, accepting the catastrophic damage caused by a failure like Lehman Brothers, or on the other hand being forced to pour billions of taxpayer dollars into an institution like AIG to protect the economy against that scale of damage. Our goal must be a stronger system that can provide the credit necessary for recovery, and that also ensures that we never find ourselves in this type of financial crisis again. We are moving quickly to achieve those goals, and we will keep at it until we have done so. Our nation deserves the Fed, the Treasury, and Congress to stop acting like socialist fools. That's what taxpayers deserve. Geithner's galling plan is as far removed from that ideal as possible. The Treasury Department has Details on Public Private Partnership Investment Program. Inquiring minds are looking at one of the examples. Step 3: The pool would then be auctioned by the FDIC, with several private sector bidders submitting bids. The highest bid from the private sector – in this example, $84 – would be the winner and would form a Public-Private Investment Fund to purchase the pool of mortgages. Step 6: The private investor would then manage the servicing of the asset pool and the timing of its disposition on an ongoing basis – using asset managers approved and subject to oversight by the FDIC. The example shows that taxpayers are on the hook for $78 out of every $84, in other words 93%, slightly better than the 97% number floating around yesterday. The website FinancialStability.Gov is loaded with links to fact sheets, white papers, and FAQs that inquiring minds may wish to investigate. Economist Galbraith Says Geithner's Plan "Extremely Dangerous". Tim Geithner has finally revealed his plan to fix the banking system and economy. Paul Krugman, James Galbraith, and others have already trashed it. In short, because the plan is yet another massive, ineffective gift to banks and Wall Street. Taxpayers, of course, will take the hit. We think Geithner is suffering from five fundamental misconceptions about what is wrong with the economy. The trouble with the economy is that the banks aren't lending. The reality: The economy is in trouble because American consumers and businesses took on way too much debt and are now collapsing under the weight of it. The banks aren't lending because their balance sheets are loaded with "bad assets" that the market has temporarily mispriced. The reality: The banks aren't lending (much) because they have decided to stop making loans to people and companies who can't pay them back. Bad assets are "bad" because the market doesn't understand how much they are really worth. The reality: The bad assets are bad because they are worth less than the banks say they are. Once we get the "bad assets" off bank balance sheets, the banks will start lending again. The reality: The banks will remain cautious about lending, because the housing market and economy are still deteriorating. So they'll sit there and say they are lending while waiting for the economy to bottom. Once the banks start lending, the economy will recover. The reality: American consumers still have debt coming out of their ears, and they'll be working it off for years. The above link above has a video of James Galbraith trashing the plan and more details on the five misconceptions. Clusterstock is also talking about Geithner's Five Big Misconceptions. The key addition to Clusterstock's version of "misconceptions" is the addition of two charts that show how dire the situation really is. I will show one of the charts (annotations in red by me). The two charts below from Ned Davis illustrate the real problem: An explosion of debt relative to GDP. The first is Nonfinancial Debt To GDP. The second is Total Debt To GDP. In Geithner's plan, this debt won't disappear. It will just be passed from banks to taxpayers, where it will sit until the government finally admits that a major portion of it will never be paid back. The above chart is similar to those detailed in Fiat World Mathematical Model. Here is the ending snip on psychology that is at the heart of the matter. What happens next depends somewhat on the political will of the central banks and politicians. However, it depends more on the psychology of the borrowers. If consumers and businesses refuse to spend and instead pay back debts (or default on them along with rising unemployment), the picture simply is not inflationary, at least to any significant decree. 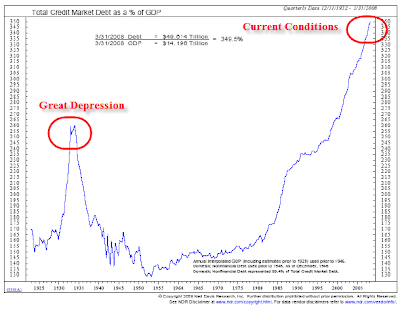 The credit bubble that just popped exceeded that preceding the great depression, not just in the US but worldwide. Thus, it is unrealistic to expect the deflationary bust to be anything other than the biggest bust in history. Those looking for hyperinflation or even strong inflation in light of the above, are simply looking at the wrong model. At some point the market value of credit will start expanding again, but that is likely further down the road, and weaker in scope than most think. Henry Blodget's Five Misconceptions are another way of looking at the psychology of the situation. The sad reality is that both Geithner and Bernanake are trapped in academic wonderland with failed models about what happened in the Great Depression and why. Geithner said "Simply hoping for banks to work these assets off over time risks prolonging the crisis in a repeat of the Japanese experience." I agree. Unfortunately, Geithner's solution is to Zombify the taxpayer instead. What needs to happen is for banks to write off the bad debts. The Fed pleaded with Japan to do just that. Now Bernanke and Geithner refuse to follow that advice. Bear in mind this insanity is just round 1. When it does not spur lending for reasons stated above, Geithner will be back at it begging for more taxpayer funds to bailout the banks. By the way, is this even legal? Offering no collateral loans is a handout. Many on the Fed, including Bernanke have stated the Fed can provide liquidity not capital. What is a no-recourse loan but capital? Of course the Fed is offering these guarantees via the FDIC. Flashback March 6, 2009 Bill Seeks to Let FDIC Borrow up to $500 Billion. Now we know the true purpose of that $500 billion. The intent never was to "rebuild its fund that insures consumers' deposits". The intent all along was to swindle taxpayers to the tune of $500 billion dollars. Rest assured this will not be temporary. It is a permanent swindle. Is there any taxpayer swindle that Senator Dodd is not part of? Once again the hyperinflationists will be screaming at the top of their lungs over this plan. The plan is certainly worth screaming about, but not because it will cause hyperinflation. Indeed, the real danger is that Geithner's plan will prolong the agony further zombifying taxpayers by saddling them with debt that cannot be paid back, while doing nothing to spur lending. The chart above in conjunction with changing consumer attitudes toward debt, ensures that hyperinflation is not remotely in the picture. All Geithner is doing is making the problem worse. Tim Geithner is the most dangerous man in America, and Obama is too blind to see it.